Online play? Seventeen characters? A fraction of the price? We can't wait. Turns out, you don't need a $250 3DS to enjoy a little Street Fighter on the go. In fact, you may already the own the hardware. Although we thoroughly enjoyed Capcom's Super Street Fighter IV 3D Edition, which is both a technical achievement and thoroughly entertaining, we had to spend $249.99 and then $39.99 to purchase both the 3DS and the game, respectively. That's a hefty sum of cash for many gamers, but thankfully, Capcom has a low cost alternative in the form of Street Fighter IV, currently available for the iPhone via the App Store, and later this year, Street Fighter IV Volt arrives. Volt, in particular, should be on your must have list, as the game includes 17 of the franchise's best warriors, including Ryu, Chun-Li and Blanka. Most importantly, it comes with three characters you won't find in the previous iPhone Street Fighter: Balrog, Vega and Cody. That, however, isn't the coolest feature. What separates this title from its predecessor is online play (there's also local multiplayer through Bluetooth). No word on price, but we expect Volt to cost between $4.99 and $9.99, which still puts it well below Super Street Fighter IV 3D's $40 asking price. 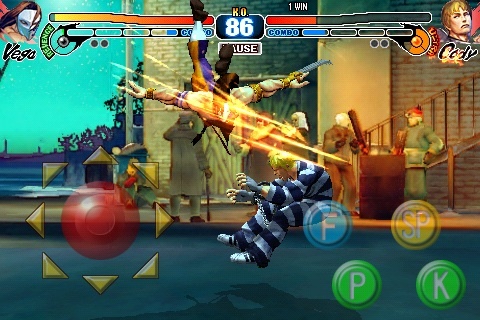 It may not have 3D special effects or an over the shoulder view, but for iPhone gamers, Street Fighter IV Volt appears to be a great way to pummel opponents on the go. We just hope it's good.